Ouch. My English teacher heart was broken, because I’m pretty sure his English 10 teacher designed the unit with better objectives and intentions than just worksheets… but to the student, that’s all he was doing. That conversation has driven me to get more out of every text, short or long, and to make every story memorable through the skills, the experiences, or the factual knowledge gained. Teaming up with me to talk about this is Lauralee Moss from the Language Arts Classroom. Disclaimer: As always, you’ll need to check your desired list of stories with others, such as your administrators (if it’s a controversial text) or the teachers above and below you (to ensure that students aren’t getting the same stories too many times). 1. Group your story collection differently. 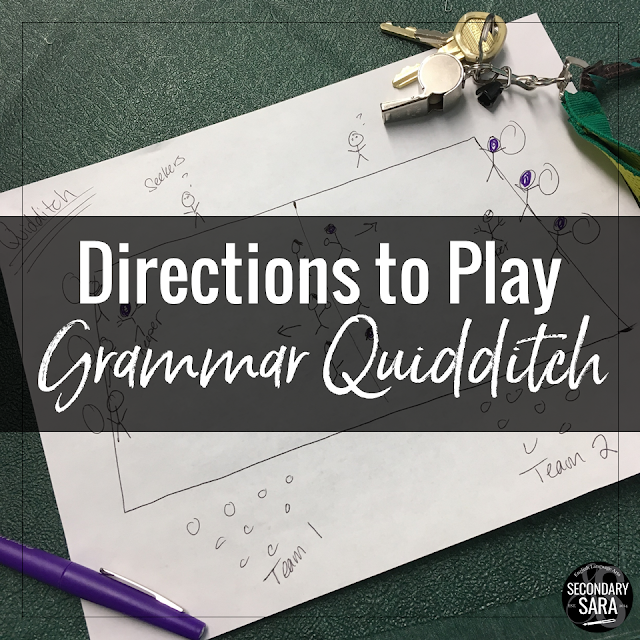 Sara: Students love when they can see the “why” behind what we do in class, and if you have a thematic, skill-based, or other logically-grouped collection of stories, it helps a TON with buy-in. For example, do scary stories or unreliable narrators around Halloween, tales of kindness around Thanksgiving or December, or surprise-ending stories during the slow winter months. 2. Let students lead the discussion. Sara: Short stories are a great time to let students practice discussion skills, whether that’s in a Socratic Seminar or by peer-teaching and presenting. One year, while teaching a class that was ready for it, I assigned a different short story to each small group, and THEY had to teach their story to the class (with my guidelines). The non-presenting students still had to read the story before the presentation day, and ALL students took a quiz on the story either before or after the student-led presentation. Engagement was high, and I had one short story a week for 9 weeks (no prep!). Read more about it (and get my materials) by clicking here. Lauralee: Creating student choice greatly encourages discussion. I draw images for students (yes, I draw for them!) to show them how I relate to stories. Sometimes I have groups create visual maps to decorate the room. As an alternative, I provide students with an assortment of graphic organizers and encourage them to find what best works for them. Plus, this is an easy way to divide students into groups and have students present their findings. There are a variety of tasks they complete along the way to check for understanding, but by the end of the unit, they’ve built their endurance and comprehension skills to handle more complex text! Lauralee: Short stories lend themselves to differentiation, especially with grammar. For instance when I teach “The Colomber”, some students will study the parts of speech, others will look at phrases, and a final group will analyze clauses. This builds the idea that grammar is part of what we read. It also emphasizes the idea that analyzing stories in varying ways is encouraged. 4. Shake up what tasks accompany the text. Sara: It can be tempting to build routine with the worksheets or tasks that accompany each story, but varying the discussion, writing, or reading skills will keep students feeling like they’re gaining something new and valuable each time. 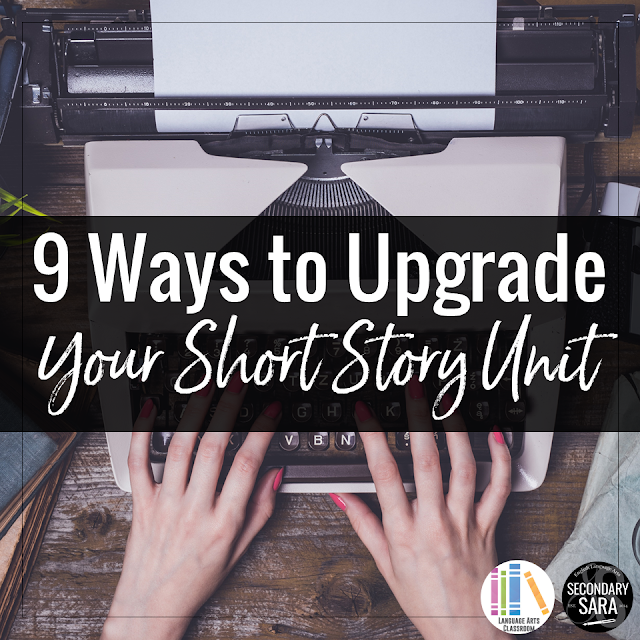 Lauralee: When i first developed my short story units, I kept a list of varying tasks. The list included group work, vocabulary games, coloring sheets, student-made quizzes, and more. I tried to hit each task once so that each story had a new approach. 5. Use the stories as mentor texts for writing. 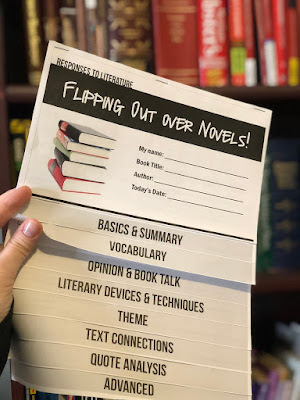 Sara: Even if it’s only a quick write, I try to place a narrative writing task in close proximity to pieces of literature, while the author’s writing style is fresh on their minds. For example, I might assign them to write an alternate ending or epilogue to the story, or have them write a full (original) short story in the author’s style. Lauralee: One way I get students to connect stories is through writing. Since I teach short stories at the beginning of the year, I also cover writing expectations too. To teach students transitions between paragraphs, I ask students to find the commonality between two stories. We will work on providing a transition from one paragraph to the next. 6. Gauge what interests your class. 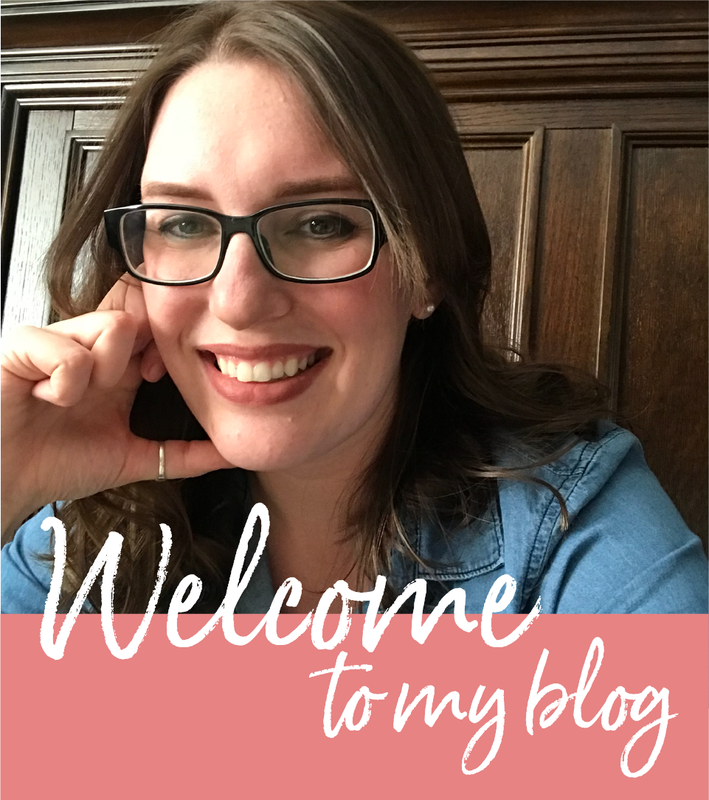 Lauralee: At the start of the year, I can learn what interests my students. When each short story is different, I can see if classes appreciate dry humor, if they enjoy mysteries. I let this knowledge shape the rest of my semester, especially with nonfiction. Sara: If it’s a text that I don’t think will immediately appeal to them, I try to connect the story to something that IS relatable, such as bullying (“All Summer in a Day”) or stupid decisions (“The Bet”). Lauralee: The activities with short stories are, well, short. I can provide my students with fast feedback. They learn what I expect, how I grade, and what the next level of their educational career is like. Sara: Fast feedback can be a quick assessment of an isolated concept (like theme), or it can look like be a benchmark assessment of general reading skills (annotation) and questions (such as giving them SAT-like questions with the text). 8. Elevate the “language arts” language. Lauralee: Especially with my freshmen, I must cover basic literary devices. They all know some, but they come from a variety of feeder schools, so they’ve studied different ones. While this isn’t a problem at all, we need to have specific and shared language to improve class discussions. Also, students may not have studied colors and their meanings. Teaching short stories allows me to introduce this concept and bring a new level of understanding to students. We are looking at literature with new tools. Sara: Short stories are a great entry into lenses and literary criticism. For example, I let students do a first read of Langston Hughes’ “Thank You, Ma’am” by themselves before reading it as a class and eliciting “mind blown” reactions with the feminist, Christian, and other levels of debatably “hidden” meaning. 9. Build a classroom community. Lauralee: One of the first things I ask students about their reading is, “what changed you?” For instance, when I teach “The Most Dangerous Game,” students will respond that they now think of animals and their fear differently. They feel empathetic toward animals that die for meat. They think the characters in “The Lady or the Tiger” are ridiculous - and that is acceptable! I’m thrilled we now have “inside jokes” as a class. These class discussions bring meaning to the stories, and we build a classroom community from that. Sara: Community can also be built through collaborative writing in response to short stories. For example, in my “Gift of the Magi” unit, students write literary analysis essays in groups (in addition to discussions about the ironic ending). This way, they’re building shared experience on several levels and working with different people. I LOVE the idea of having groups study different stories to present to their classmates! I think I can certainly use many of these ideas!